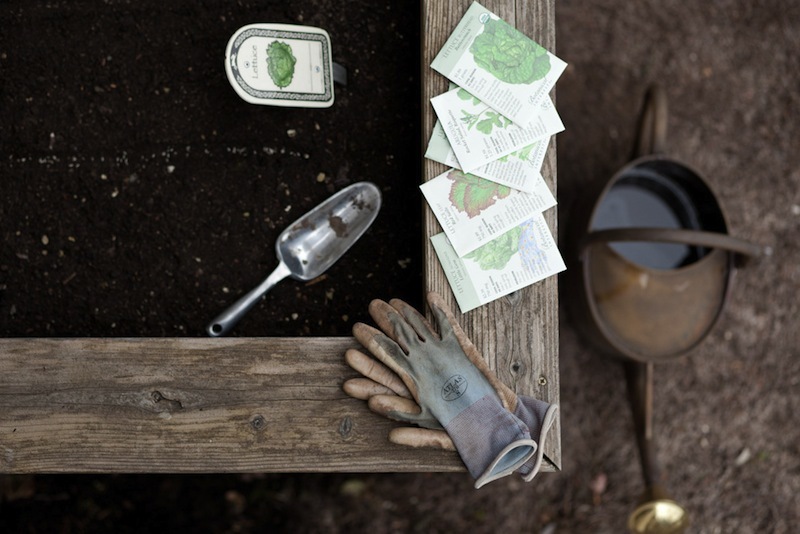 The beauty of being an Oregonian is having pristine and diverse ecosystems across the state. Creative people can get the most out of these natural playgrounds with multimodal transportation. These trips are for the gear hounds and the curious. 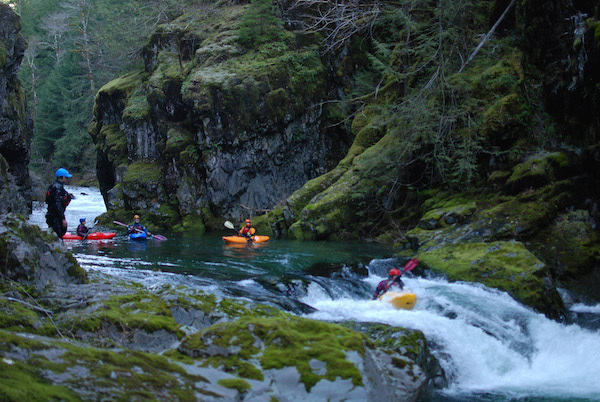 For more advanced thrill-seekers, whitewater kayaking Lower Opal Creek is a challenge well worth the reward. Widely considered among kayakers as one of the best and most beautiful boating runs in the region, this section of the Santiam River has class IV canyon rapids, crystal clear water and pristine forest. To access the put-in, drive along Little North Santiam Road to Forest Road 2209 for four-and-a-half miles until you reach the trailhead. From here you will need to carry your kayak as you hike three-quarters of a mile to your destination. While hiking with a kayak requires some stamina, the trail is easy. Soon after crossing Gold Creek, follow the first trail to the right until you reach the river. Once you’ve reached the put-in, you’ll see relics from the mining days in the 1800s—including a mine shaft and rail car. Once in the water, get ready for your first significant drop, “Big Ugly,” quickly followed by “Big Fluffy,” a fifteen-foot waterfall and the largest single drop of the run. Use caution when approaching these and prepare to pull over for some scouting, although all of the drops can be scouted via boat by experienced boaters. Take some time to do the research before your trip to determine strategies for safely traversing these larger rapids. 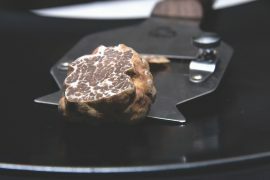 They may require some trial and error before mastering, but you’ll quickly see what the hype is about. The gorge at the bottom of Big Fluffy is a hidden oasis only experienced by boaters courageous enough to take the plunge. The next and final drop, known as “Thor’s Playroom,” falls into Three Pools. The entrance offers several different “doors” or entry points, all with their own challenges and character. This drop is powerful and can easily knock equipment from its user, but there is plenty of room to recover as this is the take-out point and the car is only a short hike away. Pack up your tackle and get ready to hit the trails. For the perfect multisport experience of the Menagerie Wilderness in Central Oregon, mountain bike along the Deschutes River, and fly-fish your way toward Trout Creek Campground on the lower Deschutes. Bordering the Confederated Tribes of Warm Springs, the Trout Creek Trail is a vestige of the early twentieth century when two tycoons built competing railways between Bend and the mouth of the Deschutes. Thanks to the losing side, we now reap the benefits of the primed land. From the trailhead, start pedaling downriver along the old railroad grade. While riding beneath a canopy of Douglas firs and alongside vibrant rhododendron bushes, take in the desert canyon views and flowing river and scope out fishing holes to cast in along the way. This is not a technically demanding trail, and the scenery is spectacular. Once you reach Trout Creek Campground, park your bike and scope out a spot to fish. World famous for its abundance of summer steelhead and rainbow trout known as redsides, anglers from near and far flock to this premiere destination. Chinook salmon and the threatened bull trout are also prevalent here. Trout season runs from the last Saturday in April until October 31, and remains open for steelhead until December 31. January through the end of April is a resting time and spawning season for steelhead. 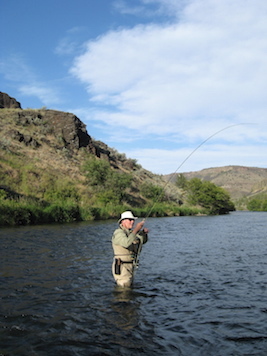 Deschutes River regulations prohibit fishing from a boat, so chest waders are a must. Success in fly-fishing can be dependent on flies, so be sure to bring a good assortment as well as a decent graphite rod. If you’re new to the sport, there are plenty of guides and instructors in the area. Scott Blackwell of High Desert Drifters Guides and Outfitters said what makes the area so great is its accessibility and proximity to Bend and Portland. Unfortunately this is also its downside. The area gets a lot of use, which is not ideal for fly-fishing. “If you can get across the river, there are far fewer people and you’ll double your fishing,” he said. “On a hot day, bring a float tube and kick across.” A tribal permit is required for fishing on the reservation side of the river. Daily passes are $14 and can be purchased at tribalpermit.com. Be aware: There are rattlesnakes and poison oak. Remember to pack plenty of water as there is no potable water at Mecca Flat or Trout Creek Campground. If you’ve reached your adventure threshold for the day, there are shuttle services such as Pete’s River Shuttle that can bring your car to you. If not, bike-and-fish the seven-and-a-half miles back, or plan ahead with a relay, leaving a second car at the campground (perhaps even with a campsite to prolong the adventure). For your next adventure, start with a night of camping under the stars at Collier Memorial State Park before venturing through the nearby trails by day via horseback. A new four-corral primitive horse camp is located at the park’s trailhead. The corral is first come, first serve and there is one horse allowed per corral. If it is full, horses are allowed alongside the trailer at your campsite, as long as the horse is hobbled or fenced. Campsites are $19 with or without the use of the corrals. 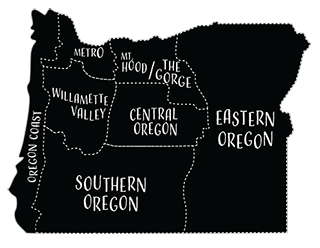 Logging is one of Oregon’s, and the Pacific Northwest’s, defining industries, to which the area pays homage. This park is home to an impressive outdoor museum of historic logging, complete with rare and antique logging equipment dating from the 1880s, as well as more modern pieces. In 2004, the park raised $300,000 toward preserving its logging heritage. The museum was heavily renovated and artifacts were restored, making it a must-see for those passing through. A sixteen-foot cross section from the largest Douglas fir tree ever cut as well as a relocated pioneer village round out the park’s attractions. At nearly 540 acres, the spacious and well-maintained campground has sixty-eight sites, hot showers, twenty-four-hour coinoperated laundry, and a group kitchen shelter with full electricity and plumbing. 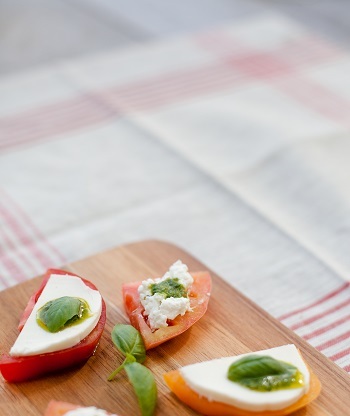 In the summer, you can even catch a movie on weekend evenings. Camping is available May 1 through October 1, but the day-use area is open year round. The A Loop of the campground is first come, first serve, while the B Loop can be reserved online. This park can get busy, so it is best to reserve ahead of time. The Williamson River, known for its quality trout, converges with Spring Creek at the park, making for prime fishing conditions. Wild rainbow trout from Klamath Lake meander their way into the river and have been known to reach twelve pounds and twenty inches. The season is open May through October, giving anglers half the year to make their next big catch. 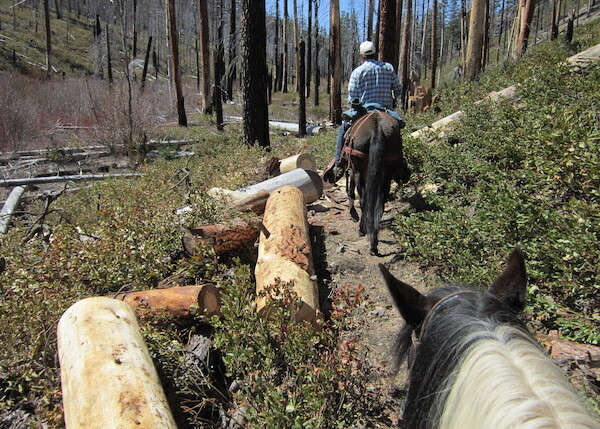 The park is surrounded by several old logging roads that are perfect for horseback riding. One primitive ten-mile route leads to Jackson F. Kimball State Recreation Site, the prettiest state park in Oregon according to Collier park manager, Todd Honeywell. 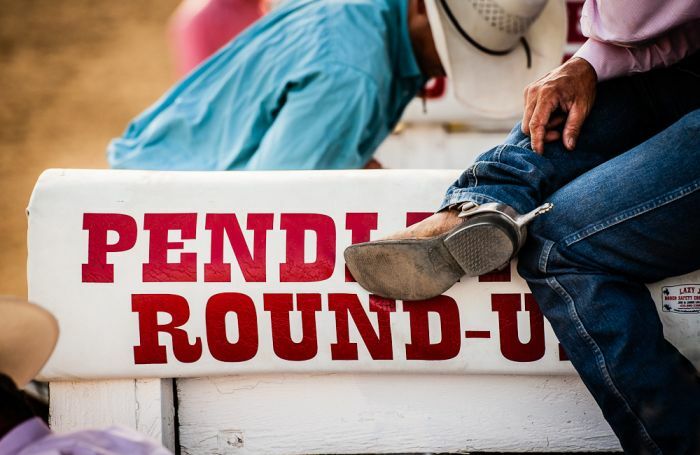 Riders must commit to a roundtrip back to Collier as there are no horse corrals at Kimball. Winding through the Winema National Forest, and secluded from the machinery of modern day, riders overlap in time with their pioneer predecessors along serene paths lined with ponderosa pines.